Diagnostic Communication with Road-Vehicles and Non-Road Mobile Machinery examines the communication between a diagnostic tester and E/E systems of road-vehicles and non-road mobile machinery such as agricultural machines and construction equipment. The title also contains the description of E/E systems (control units and in-vehicle networks), the communication protocols (e.g. OBD, J1939 and UDS on CAN / IP), and a glimpse into the near future covering remote, cloud-based diagnostics and cybersecurity threats. 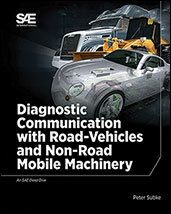 If you do not have access to SAE MOBILUS via username/password or institutional access, you can still purchase the Book, Diagnostic Communication with Road-Vehicles and Non-Road Mobile Machinery.